One of the true immortals of 20th-century jazz, the legendary “Saxophone Colossus,” Sonny Rollins, continues to amaze fans and critics alike in jazz’s second century. In the words of critic Gary Giddins: “Rollins looms as an invincible presence after fifty years: one of the most cunning, surprising, and original of jazz visionaries and one of the very few musicians whose (infrequent) concert appearances and recordings generate intense expectations and heated postmortems.” Rollins returns to the SF Jazz Festival on the heels of his first studio CD in five years, "Sonny, Please". Jazz reviewer Jim McElroy wrote of Rollin's latest effort, "Rollins has a new label and a new recording and those of us who love to listen to jazz can now rejoice for in all the world there is but one Sonny Rollins, and on Sonny, Please, he proves he is still at the top of his game. From the very first song, the title track "Sonny, Please", Rollins and his group are off and running and there is no let up. "Sonny, Please" has a very strong bass line provided by Bob Crenshaw and this is backed up beautifully by the drums of Steve Jordan who with the rest of the band play with a style that lets you know that they more than just play music they live it. Rollins tears into the song full tilt and the result is breathtaking. Add in the percussion work of Kimati Dinizulu and a healthy dose of Clifton Anderson on trombone and you have the best of the best at work here, it rarely gets any better. Rollins,who shows no signs of slowing down, not only demonstrates his immense power on the saxophone but also as a composer, having created four out of the seven tracks on this recording, each with its own unique flavor and style. He still finds the time to give new life to an old classic , such as his soulful rendition of Noel Coward's "Someday I'll Find You". I am sure the Coward would have been impressed for this is a flawless recording, the players here are the masters of their craft and with Rollins as their leader reach amazing new heights. "Nishi" is a straight ahead jazz number that has a real gift in the duel horn playing of both Rollins and Clifton Anderson , backed up by the bass of Bob Crenshaw and the guitar of Bobby Broom. "Nishi" swings and if you listen hard enough you can hear the calling out of the musicians themselves, this is music so good you cannot help out shout about it all. "Stairway to the Stars" is a love ballad that is Rollins gift to his fans, it allows him to just soar above it all, the sound is so deep and so ingrained in him that you wonder how one person could get that much sound from just one instrument. From the high notes to the low, Sonny Rollins has complete and total control of his instrument and shows us all how it should be done. With the gentle added percussion of Kimati Dinizulu, who knows exactly where to fill in the little gaps that appear and does so without you even knowing. Dinizulu is a craftsman of the highest order as are his band mates and they provide us with an amazing joy ride of sound. "Remembering Tommy" is a generous and beautifully played number that again combines the effortless playing of Bobby Broom on guitar and Steve Jordan on drums capped off with the virtuoso playing of Rollins and Clifton Anderson. "Serenade" (Ballet Les Millions D"Arlequin) introduces us to a new band member Joe Corsello on drums and to a number that sounds pretty much like its title, there is a kind of light and airy sound to it all almost as if a ballerina was dancing right in front of the bandstand. The song sways and seems to be lighter than air. The album closes out with "Park Place Parade" a sort of lighthearted tribute to the city of New York complete with whistles and a real jaunty beat that makes you want to get up and dance around your room, (not recommended if you are listening to this while driving however). 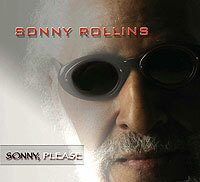 On the whole Sonny, Please is a welcomed return by one of the legends of jazz and it shows that this is someone whose talent and artistry knows no bounds or limits, welcome back Mr Rollins."